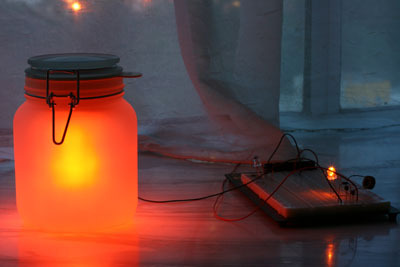 A follow-up with the Sun Jar. After I got the jar, i noticed that there are 2 potential improvements: (1) I like it to be brighter; and (2) it doesn't last long enough (only around 5 hours even when fully charged. I prefer it to last the whole night). Finally have time to disassemble it today and found that the rechargeable battery is only of 700mAh... -.-... no wonder... Replaced it with a 2700mAh battery... will see how it go. But of course, the question is whether the charging circuit efficient enough to fully charge the 2700mAh during the daytime.